The Travel Guide to Armana highlights the most important places to visit in this area of Egypt and its significance to the history of Egypt together with Ancient Egyptian facts and information about Armana. Armana was the site of a city entirely built under the instructions of Akhenaten, the father of Tutankhamun. The story of Armana and why the city was built plays a fascinating part of the History of Ancient Egypt. Akhenaten was a Pharaoh of the Eighteenth dynasty and the son of the Pharaoh Amenhotep III and Queen Tiye. He was a second son and not expected to succeed to the throne but his elder brother Thutmose died unexpectedly. Akhenaten was originally known as Amenhotep IV meaning 'Amun is Satisfied'. This title relates to the chief god Amun who was worshipped throughout Egypt, together with many hundreds of other gods. The cult of Amun was based in the Ancient Egyptian city of Karnak and was the center of worship of Amun. Karnak is located on the East Bank of Luxor, which was originally called Thebes. The Ancient Egyptians had worshipped Amun and their other animal headed gods for nearly two thousand years. Thebes was the centre of the Amun cult and one of its capitals. Thebes was the home of many thousands of Ancient Egyptians. A few years into his reign Akhenaten had a religious revelation which resulted in his belief that their was one god, the sun god Aten, and that all the other ancient gods should be discarded. His religious revolution forced his subjects to accept and worship the new god Aten. 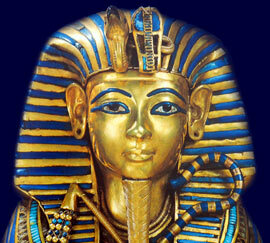 The pHaroah then changed his name from Amenhotep IV to Akhenaten meaning the 'Effective spirit of Aten'. He wanted to severe all ties with the old religion and therefore set about building the city of Akhetaten (meaning the Horizon of the Aten) at Amarna. Akhetaten believed that the location at Armana was revealed to him by the Aten and this is confirmed in a stele, or stone monument, cut high into the rock overlooking Armana. The inhabitants of Thebes were eventually ordered to leave the city and their homes and move 250 miles away to Akhetaten at el Amarna. But first the new city had to be built. And the building at Armana had to be fast and cheap. A new building system was designed using small pre-cut stone blocks called talatat, all the same size and 50 cm long. These pre-cut stone blocks and the use of mud bricks enabled the city of Akhetaten at el Amarna to be completed in less than seven years. The city of Akhetaten at el Amarna is now in ruins but it is still a fascinating place to visit. The Ancient Egyptians hated the heretic King Akenaten and his new ideas about religion. Following his death the city was destroyed and the inhabitants returned to the old city at Thebes where they again worshipped Amum and the other gods. Many of the stone blocks were removed and re-used for new buildings in Thebes. An attempt was made to destroy or deface all records and monuments to Akenaten as if he never existed.